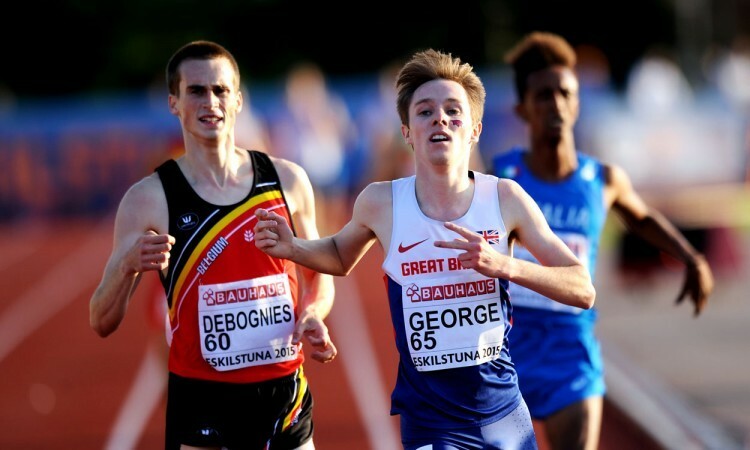 Great Britain’s athletes won another five medals on the penultimate day of European Junior Championships action in Eskilstuna, Sweden, on Saturday to double the nation’s haul. 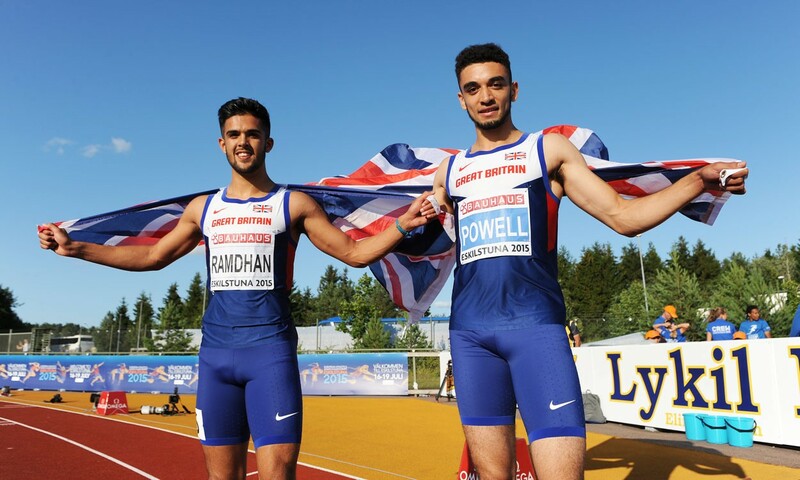 Following GB’s sprint success from the day before, there was another British 1-2 as Tommy Ramdhan took the 200m title ahead of team-mate Elliott Powell as a +4.1m/s wind assisted them to times of 20.57 and 20.72 respectively. Norwegian sprinters Even Meinseth, the son of women’s national 400m record-holder Sølvi, and Jonathan Quarcoo filled the next two spots as Britain’s third 200m representative, Freddie Owsley, ran 21.13 for sixth. Just before that, Shannon Hylton had been another sprinter to add a medal to GB’s haul as she clocked 22.73 (+2.6m/s) to win silver in the women’s event behind Germany’s Gina Luckenkemper, who had also secured victory ahead of the Briton at the recent Bauhaus Junior Gala. Luckenkemper’s wind-assisted winning time was 22.41 as Hylton’s team-mate Charlotte McLennaghan finished fourth in 23.30. Hylton, whose twin sister Cheriece had won a medal of the same colour in the 400m the day before, had earlier run 22.79 to win the first semi-final but that time she was also assisted by an illegal wind (+4.2m/s). But Britain’s success wasn’t limited to the sprints and Josh Kerr showed great judgement in the 1500m final, the Scottish runner securing the title with a strong finish. Clocking 3:49.62 he beat France’s Baptiste Mischler (3:49.88) and Ukraine’s Andriy Aliksiychuk (3:50.22) as his GB team-mate Robbie Fitzgibbon was sixth in 3:50.67. Similarly, Alex George impressed in the 5000m final as he followed in the footsteps of the likes of Mo Farah to claim a title that the double Olympic, world and European champion himself won in 2001. Leading at the bell then letting some of his rivals pass before striking on the final bend, the US-based runner used his 3:44 1500m PB to good effect in a slow-run race to move away in the home straight and secure the title with a time of 14:34.42. Among those behind him was Italy’s European cross-country champion Yemaneberhan Crippa in third and his fellow Britons – Gus Cockle in seventh and Christopher Olley in 11th. Spain’s Diego Garcia walked to a world junior lead of 40:05.21 as he took a comfortable victory in the 10,000m walk. Russia’s Vladiszlav Saraykin was second with 40:59.28 – ahead of Spain’s Pablo Oliva (41:00.73). Britain’s Callum Wilkinson finished seventh with a UK junior best of 41:34.63, taking more than a minute off his PB and finishing 17 seconds inside the 1987 national mark of Darrell Stone. He was also under the national road best. Belgium’s Renee Eykens scored a big win in the women’s 800m as she clocked 2:02.83 to beat Germany’s Sarah Schmidt and Iceland’s defending champion Anita Hinriksdottir, who employed her usual front-running tactics. Brits Molly Long (2:06.00) and Mhairi Hendry (2:06.38) were run out of the medals in fourth and fifth respectively. Germany’s Alina Reh dominated the 3000m, clocking 9:12.29 to win by more than four seconds. She is the current European junior No.1 in both the 3000m and 5000m and is also entered for the longer distance taking place on Sunday. The women’s 3000m steeplechase was won by Turkey’s Sümeyye Erol in a 10:19.15 PB. A world junior lead and national senior record of 18.40m secured Turkey’s Emel Dereli shot victory as she won by more than a metre ahead of Germany’s Claudine Vita, who claimed her second silver after her discus medal from the day before. GB’s Adele Nicoll was eighth with a 15.55m PB after having also thrown a lifetime best to make the final. France’s Audrey Ciofani won gold in the hammer with 67.20m to beat a field including the likes of world junior No.1 Reka Gyuratz of Hungary, who finished fifth with 62.94m. Slovenia’s Matija Muhar upset the home favourite Simon Litzell to claim the javelin title, throwing a world junior lead and national junior record of 79.20m to beat the Swede’s 78.34m. GB’s Harry Hughes, who had thrown a PB of 71.73m to qualify for the final, managed a best of 69.92m from his three attempts placing him 11th. There was a surprise in the pole vault as Switzerland’s Angelica Moser cleared 4.35m to beat Russia’s world junior champion and 4.61m-vaulter Alena Lutkovskaya who managed a best of 4.20m. Denmark’s Jonas Jensen won the high jump title on countback from Poland’s Dawid Wawrzyniak as both athletes set PBs with their 2.23m clearances. Individual 400m silver medallist Warholm leads the decathlon overnight with 4239 points, the world youth octathlon champion having won the 100m, long jump and 400m on the same day as his individual medal success. GB’s Tim Duckworth, who was best in the high jump as he cleared 2.06m, has 3773 points for 17th after five events. UK senior champion Kyle Langford won the second 800m semi final, his 1:49.95 the quickest overall. His GB team-mates Daniel Rowden and Spencer Thomas won’t be joining him in the final after third-place finishes in their heats. Britain’s Jack Lawrie was the third quickest in the 400m hurdles semi finals as he clocked 52.30 when finishing behind Germany’s Joshua Abuaku who ran a 51.72 PB, while Italy’s Ayomide Folorunso qualified as quickest for the women’s final with 58.04. British discus thrower George Armstrong had a long wait after his qualification pool to see that his 54.66m was just enough to take him through to the final. Going out at this stage were the winners of the shot and hammer here respectively, Poland’s Konrad Bukowiecki and Hungary’s Bence Halasz. GB’s Montel Nevers was among those to achieve the automatic qualifying mark of 15.70m to progress in the triple jump.